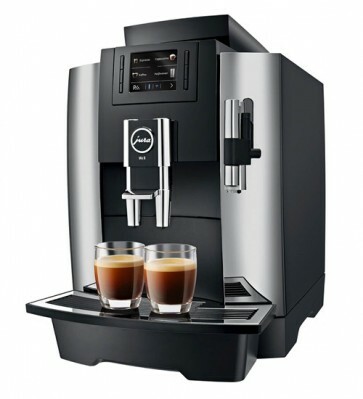 Put a spring in your coworkers' step with the Jura WE8 Superautomatic Espresso Machine. The WE8 offers the capacity for 30 to 40 drinks a day—just the thing for a busy office space. And, thanks to the large reservoir, bean hopper and drip tray you can focus less on upkeep and more on delicious coffee (and work, obviously). Equipped with effort-saving features like descale-reducing smart filters, one-touch operation and a simplified control schema, the WE8 is the quintessential breakroom barista. Office Espresso - The WE8's larger bean hopper, reservoir and drip tray make it an excellent choice as a small office coffee solution. PEP Brewing - Jura's patented Pulse Extraction Process varies the pressure in the brew unit, producing a rounder, more balanced shot. CLEARYL Smart Filter - An RFID-equipped water filter keeps track of usage and alerts you to when it needs to be changed. One-touch Lattes - Jura's milk siphon system allows for milk-based drinks at the touch of a button, no manual steaming required. Large Bean Hopper - A 1.1-pound bean hopper means less frequent upkeep for busy employees. Simplified Menu - Eschewing the turn dial or touchscreen of other models, the WE8 offers a simplified drink menu ideal for a quick caffeine fix. Office Mate - The WE8 is a better option than most for office settings. It's easier to use than a semi-automatic, and better equipped for high traffic and infrequent maintenance than any other machine at its price point. Simple - The simple push button controls and limited drink menu do wonders for busy environments. Shot Quality - The new PEP system improves on shot flavor over older, non-equipped models. Twin Dispensers - Milk drinks get routed through the taller dispenser on the right. We bet more than one groggy employee will forget all about it on their way to a 9AM meeting. Fingerprints - The polished chrome accents on the front face of the machine are flashy, but will definitely smudge with printer ink and Friday-donut-glazed fingers. Think of the WE8 as the larger compatriot of the home-targeted E8. Soap out drip tray and dump box weekly. Wipe out bean hopper between refills. Follow on-screen instructions for filter changes and milk system cleaning.